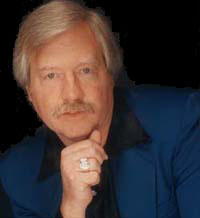 Jerry Harris, one of the most talented and sought after hypnotists in the country, poses for a portrait. He had the ticket in his hand but something was holding him back. The small charter flight was about to depart but the notion of flying on a four-seat aircraft made him feel nauseous and uncertain. Forfeiting his ticket, he took a seat and waited to reschedule his flight. Minutes later the charter flight crashed and no one survived. Jerry Harris, at the time a vice president for a major corporation, was dumbfounded. It was 1985 in Florida, and for a man who thought he was at the top of the world with a successful career, a wife and three girls, he felt utterly lost. That night he told his wife to pursue a nursing career in case something should happen to him. Instead, she secured a $1 million dollar life insurance policy for her husband. Six months later, the same tragedy happened again: another commuter flight he held a ticket but did not board crashed and no one survived. Stressed and overburdened with work, Harris began exploring hypnosis upon the recommendation of his wife and doctor. He was hooked, and immediately started studying hypnosis. Twenty-four years later, Jerry Harris, a professional hypnotist, is traveling the country an average of 300 days per year to perform a dynamic show blending “entertainment with education.” He’ll be performing at the Kootenai County Fairgrounds on Wednesday, August 22nd through Sunday, August 26th. While many people have had a glimpse of hypnosis, defining it remains murky. “It’s nothing more than a combination of concentration and relaxation,” said Harris, who compares the mental state to watching a movie and becoming lost in its story and graphics. But hypnosis goes beyond the lights of the stage for Harris. “It’s a tremendous tool. I need to write a book about the people I’ve helped. The mind is the most dynamic tool in the universe. If you can help people go into their mind and release endorphins, you can see the pain go away.” Using hypnosis, Harris tells stories of helping people with multiple sclerosis, diabetes, and arthritis. For instance, one girl who came to his show lost her wallet with $200 that she had received for her birthday. She looked to no avail. Harris helped “take her back to the moment” when she lost her wallet. Yet she still couldn’t remember. Later that night, however, she found it and e-mailed Harris to tell him of her breakthrough. Other stories highlight pure entertainment. Harris recently turned a group of burly men into Russian ballerinas. While spinning and prancing, they spoke Russian to each other. “They were so good, so animated, that I made them sing,” said Harris. Afterwards people commented that they were hoarse from laughing so hard for so long.